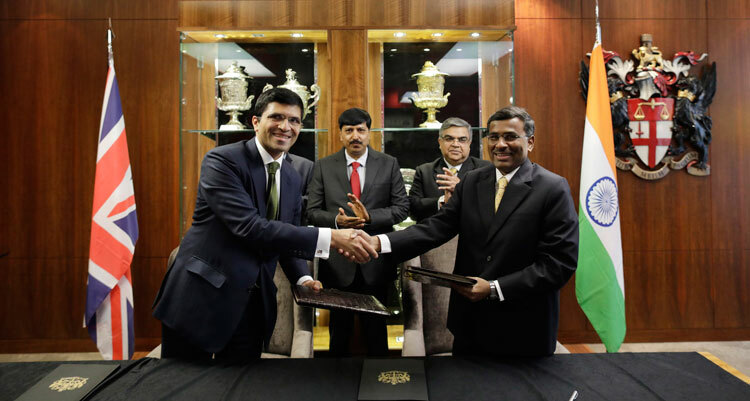 London, September 21, 2018: National Stock Exchange of India (NSE) announces today that it has signed a Memorandum of Understanding (MoU) with London Stock Exchange Group (LSEG). NSE and LSEG will work together on creating a dual listing route for Masala bonds & foreign currency bonds of Indian Issuers and explore the launch of ELITE, LSEG’s successful business support and capital raising programme for Small and Medium Enterprises (SMEs) in India in 2019. The MoU was signed by Vikram Limaye, MD & CEO, National Stock Exchange of India and Nikhil Rathi, CEO, London Stock Exchange Plc and witnessed by Shri MK Das, Principal Secretary to Hon’ble Chief Minister, Government of Gujarat, India. London Stock Exchange is the leading international listing venue for Masala bonds, having listed 46 Masala bonds which have raised over $5 billion equivalent. Together, LSEG and NSE will look to provide a route for Masala Bonds and foreign currency bonds of Indian issuers listed on London Stock Exchange to be dual listed on NSE’s International Exchange, NSE IFSC Limited, in Gujarat International Finance Tech (GIFT) city. Similarly, Masala Bonds and foreign currency bonds of Indian issuers listed on NSE IFSC in GIFT City will be dual listed on London Stock Exchange. Through the approval of a single listing document , an issuer will be able to obtain a dual listing on London Stock Exchange’s International Securities Market and GIFT City, gaining access to an enhanced investor base of global institutions based in London, as well as domestic and regional investors registered on NSE IFSC. GIFT City, a special economic zone, is India’s first International Finance Centre (IFC). NSE and LSEG also agreed to explore the launch of ELITE in India in 2019. The MoU outlines the parties’ commitment to engage with growing companies, leading financial institutions and the broader SME community across the country to integrate them with the global ELITE community. This is with ultimate goal of raising awareness of the investment opportunities in India and helping to attract more international capital into domestic capital markets. The ELITE global community today is made up of over 900 private, ambitious companies from 32 countries and over 30 sectors. “India is one of the world’s fastest growing economies. Investors across the world are keen to invest in India and benefit from its growth story. Dual listing of Masala Bonds and foreign currency bonds of Indian issuers would enhance visibility, increase liquidity in secondary markets and enhance efficiency of price discovery for the bond issuers. This would also reduce the cost of raising capital for all issuers and encourage the participation of a wider variety of issuers in the masala bond market. NSE has focused on developing an ecosystem where the SMEs can showcase their growth stories and launched EMERGE platform for the SMEs in India to raise equity funding. By jointly launching ELITE in India, we aim to enhance our offerings for SMEs by providing training, support and capacity building for these growth companies. ELITE will bring a more in-depth and formalised process to help SMEs scale up their businesses and integrate them with the global ELITE community. India’s first international financial services centre, GIFT City, and championing the development of the country’s SMEs. The National Stock Exchange of India Ltd. (NSE) is the leading stock exchange in India and the second largest in the world by nos. of trades in equity shares from January to June 2018, according to World Federation of Exchanges (WFE) report. NSE was the first exchange in India to implement electronic or screen-based trading. It began operations in 1994 and is ranked as the largest stock exchange in India in terms of total and average daily turnover for equity shares every year since 1995, based on SEBI data. NSE has a fully-integrated business model comprising exchange listings, trading services, clearing and settlement services, indices, market data feeds, technology solutions and financial education offerings. NSE also oversees compliance by trading and clearing members with the rules and regulations of the exchange. NSE is a pioneer in technology and ensures the reliability and performance of its systems through a culture of innovation and investment in technology. NSE believes that the scale and breadth of its products and services, sustained leadership positions across multiple asset classes in India and globally enable it to be highly reactive to market demands and changes and deliver innovation in both trading and non-trading businesses to provide high-quality data and services to market participants and clients. NSE IFSC is a wholly owned subsidiary of NSE. The trading at NSE IFSC Limited was launched on June 5, 2017 post receiving grant of recognition from SEBI. NSE IFSC has already launched trading in Indian and Global stock derivatives, Index derivatives, currency derivatives, and non-agriculture commodity derivatives. SEBI has also permitted trading in wide range of products including equity shares of companies incorporated outside of India, depository receipts, debt securities of eligible issuers, interest rate derivatives and all categories of exchange traded products that are available for trading in stock exchanges in FATF/ IOSCO compliant jurisdictions. ELITE is a platform and ecosystem that helps private, ambitious companies grow, offering them access to education, business support and direct contact with the UK and international financial and advisory community. Management teams are guided on how best to fast-track their development, how to access the most suitable funding for their needs, whether private equity, venture capital or the bond or equity markets, and given advice on building their profile and reach. ELITE also operates its own funding platform to enable efficient access to capital from private, professional investors. ELITE facilitates its vibrant international advisor and investor community the opportunity to engage with a pool of high quality, dynamic companies and entrepreneurs, all of whom are open to the advice, opportunities and connections that the programme offers. There are over 900 businesses from across 32 countries in the ELITE community. They are generating over £50 billion in combined revenues and employ approximately 400,000 people across Europe and internationally.